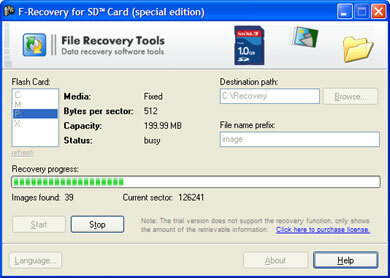 F-Recovery for SD undelete lost data from SD cards used by digital cameras. If you have unintentionally deleted or formatted pictures, videos or sound files on your data medium or have pulled it out during a write operation, not to worry - F-Recovery for SD Card can easily, quickly and absolutely reliably reconstruct the lost data. Older digital cameras used internal memory and proprietary cables and software to download images to a PC. Data undelete tool for SD Card. All manufacturers of digital cameras offer a much higher, in fact, nearly unlimited number of pictures to be stored on standardized media like SD cards, to name a few. Images stored on this type of medium are portable and can be read in standard readers that are available everywhere. Unlike their predecessors that used film, new cameras allow images to be erased and the space on the media reused. The media can also be bulk erased or formatted, removing any images from the storage media. Imagine a babys first steps or a childs wedding being lost forever because someone pressed the wrong button! That is where F-Recovery for SD Card comes to the rescue. Qweas is providing links to F-Recovery for SD Card 2.5 as a courtesy, and makes no representations regarding F-Recovery for SD or any other applications or any information related thereto. Any questions, complaints or claims regarding this application F-Recovery for SD Card 2.5 must be directed to the appropriate software vendor. You may click the publisher link of F-Recovery for SD on the top of this page to get more details about the vendor.